I'll just write, free form, without hyperlinks or images. I'm writing to write, to write out loud, and writing instead of watching TV or watching Twitter. I'll write for a while, until my 2-year-old wakes up from a nap. He might nap for an hour, or two, so that gives me time to write and wonder. What if more people wore past identities more proudly? We could erode the norm of identity consistency, a norm no one lives up to anyways, and embrace change and growth for its own sake. That's a really good question. And maybe he's right. And maybe people aren't as judgmental as I think. Sometimes we want to be judged by our best work, not by our more foolish and immature moments, and I think that's partly where the "Glad I didn't have Facebook in high school" (or college) statement comes from. 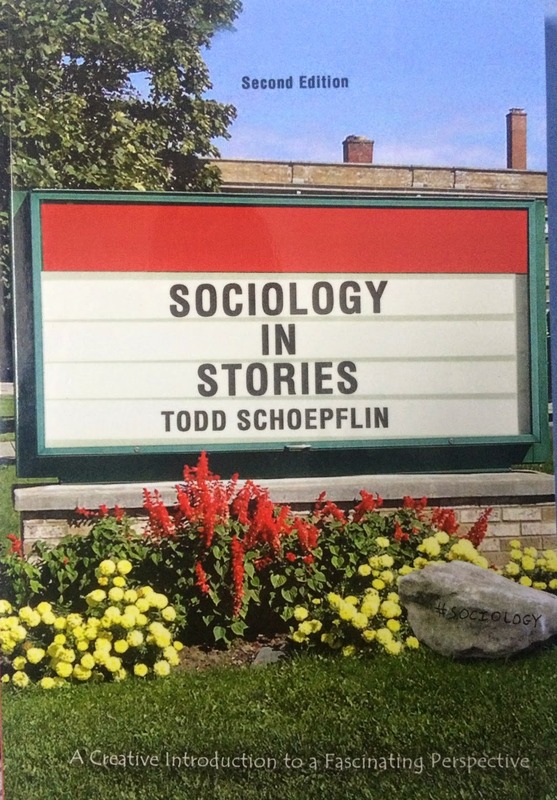 Now comes the part when I refer to something I said in Introduction to Sociology last semester. I was talking with students about Facebook, and comparing Facebook with television, and then I blurted out "Facebook is television." I don't know if anybody has already said that, or written about it. Please alert me if someone has. I don't want to steal someone else's idea (or plagiarize). It's getting impossible to be original in this day and age. There are too many smart people writing smart things. Well, "Facebook is television" is a pretty simple thought anyway. Facebook, like television, is something that's on. Remember when Bruce Springsteen wrote "57 Channels (And Nothin' On)" Sugar, that's hyperlink number two. A blogger can't help himself. Anyway, the Springsteen song is from 1992. We were already complaining about all the crap that's on. Now it's three million channels and nothing is on. I think that's a reason people complain about Facebook: much of the time, there's nothing on. That's not to disrespect our friends and family members who post pictures of their kids or their dinner. But how many times does one want to see a rerun of somebody else's cute kid? How many times can you watch a rerun of How I Met Your Mother? (What's up with that show, I can't figure it out for the life of me. I've never made it through an episode, so I must be referring to people who watch it a lot). Well, you get the point. There's a lot on. There's a lot to consume. Same for Twitter. Which is why I wonder if the term "backchannel" should just be "channel." The hashtag lets us check out what's going on behind the scenes (or, should I say, what's going on in the scene). It's surfing through Twitter and seeing what's on. Okay, I haven't said anything about producing content. I recognize we are producers-consumers these days, but I tend to focus on consumption. A serious question: what does the research tell us about the ratio of consuming to producing? Is it accurate to say that most people consume way more than they produce? I'm inclined to think from the perspective of a consumer. Maybe it's because I consume a lot. Yes, I produce too, but not as much as I consume. Honestly, I need to study up on prosumption. Maybe I give too much attention to being a consumer. In any case, thinking as a consumer, I think there's something to the notion that "Facebook is television." Facebook, Twitter, television, YouTube, Vine (first impression: Vine is pretty cool) give us a million of channels to watch (and gripe about). Forgive me for all the parentheses. I probably use too many when I write. And I know we're not always griping about what's on. We enjoy much of what we watch. What we watch makes us laugh and makes us feel a whole bunch of emotions. "A whole bunch of emotions" is a badly written phrase. It's a sign that I've been writing for 42 minutes without a break. So I will take a quick break to grab a drink of water. I'm back after a few minutes. I ended up exchanging a few text messages with my wife. Well, I'm going to give this post one quick proofread and wrap it up. Mack might surprise me and wake up any moment. And by the time I come back to this post, I might just delete it or decide not to post it. I did some proofreading and minor editing. I've been at this for an hour now. I've been thinking about this stuff for a long time, but the actual writing and editing took one hour. So know that it's not totally thought through. So why post it? Why not sit on it longer and make it better? Well, I told you, I just wanted to write out loud for a while.